Cannot be Normal Summoned/Set. 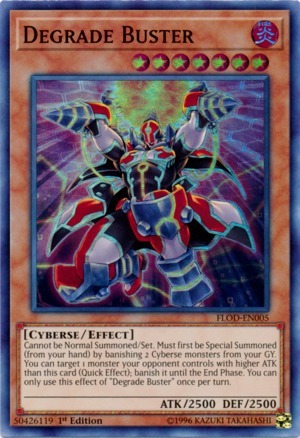 Must first be Special Summoned (from your hand) by banishing 2 Cyberse monsters from your GY. You can target 1 monster your opponent controls with ATK higher than this card (Quick Effect); banish it until the End Phase. You can only use this effect of "Degrade Buster" once per turn.